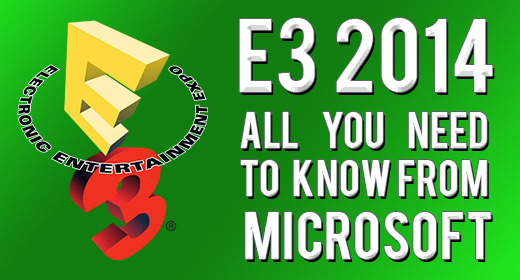 Here is everything you need to know from the Microsoft presentation from E3 2014. “Games, games, games. Oh, and by the way, did we mention we kinda screwed up with some of the Xbox One stuff?” Oh wait, is that not a direct quote? Well, that’s pretty much the rundown of what Microsoft has already had to say at E3 2014. Don’t miss these games: Call of Duty: Advanced Warfare, Forza Horizon 2, Evolve, Assassin’s Creed: Unity (play as 4 assassins with 4 people all at the same time…), Dragon Age Inquisition, Sunset Overdrive, Dance Central Spotlight, Fable Legends, Project: Spark, and Ori and the Blind Forest. Probably the ONE game announcement we have really been looking for since the Xbox One launched: SOMETHING TO DO WITH HALO! Halo: The Master Chief Collection includes all of the original series games remastered, Halo: Nightfall, and the Halo 5 Beta. Crackdown also is getting a reboot. Got the opportunity to announce the next chapter in the reimagined Tomb Raider franchise with Rise of the Tomb Raider, due Winter of 2015. So what’s your verdict on what we have seen so far from Microsoft at E3 2014? Can Microsoft make up ground with their Xbox One missteps? Let us know your feedback! Calling All Writers: We Want You! We need your questions for Episode #11! Sandra Milican Steen liked this on Facebook.